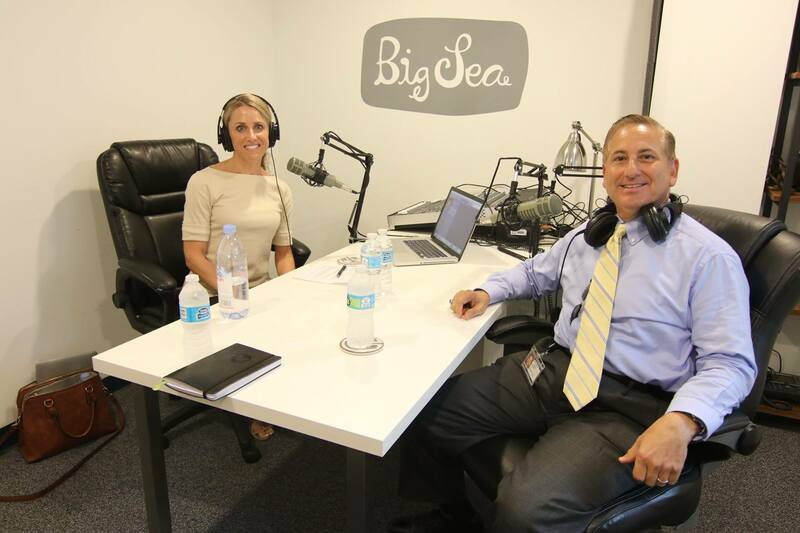 In part two of our series, SPx host Ashley Ryneska sits down with incumbent Mayor Rick Kriseman to get to the heart of his tenure so far. With an emphasis on community and the shared successes of his administration, we cover topics from his viral tweet to then-candidate Trump, to his fondness for Central Avenue, and his love and commitment to St. Pete's small businesses. Fun fact: Mayor Kriseman majored in broadcasting at the University of Florida, and used to DJ overnight from 2-6am. His preferred genre is lyrically driven music from the 60s and 70s. Mayor Kriseman grew up in Detroit, Michigan, on infamous 8 Mile Road. His father's influence remains strong with him, reminding him to always treat everyone with respect, and to take care of those who work for you. In December 2015, Mayor Kriseman's tweet to then-candidate Trump went viral, when he said in jest that he was going to "ban all Trumps" from the city of St. Pete. 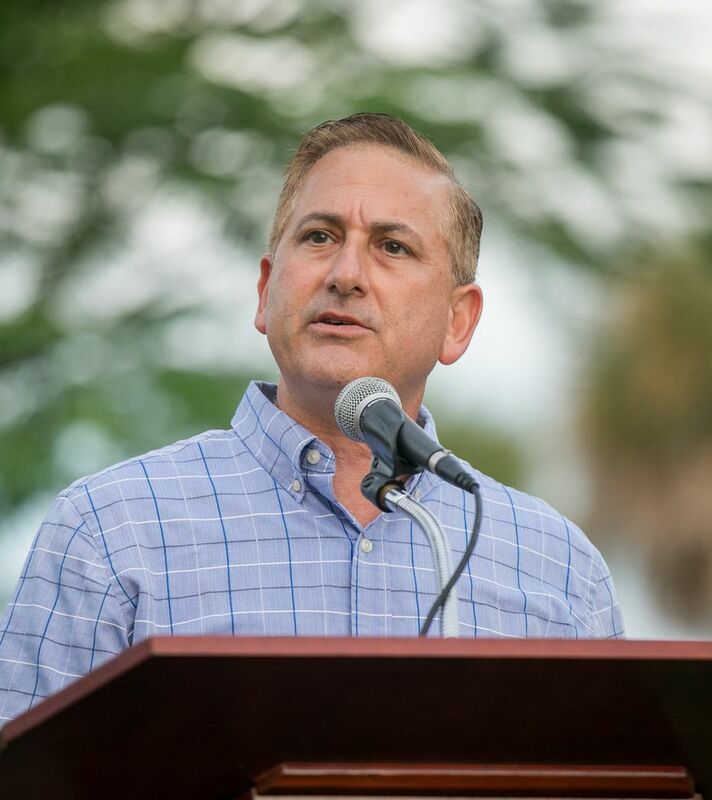 Coming from a Jewish family, Kriseman has had a very visceral reaction to the bombastic political rhetoric on the national political stage. He remains critical of the President's reaction to the violence in Charlottesville. Mayor Kriseman's relationship with Central Avenue is a two-sided one. He sees it, negatively, as a dividing line in the city, between the black and white communities. He also sees it as a culturally rich, diverse, and strong spine of the city's small businesses. Kriseman's administration looked at the historical trajectory of government interaction with South St. Pete. They found that the same approach was being taken over and over again, through multiple administrations. They are taking a new approach, with the South St. Petersburg CRA, and Instead of investing in appearance and buildings, they are investing in people and businesses. There has been a 174% increase in business registration in the past few years, with four hundred new businesses South of Central Avenue in the last four years. Support for new businesses - through partnerships: Chamber of Commerce, Greenhouse, TBBIC, and the Financial Empowerment Center. Two great examples of businesses that have thrived from these programs include Rush Hour Chicken & Waffles and Strands of Sunshine. What makes St. Pete unique and different? Kriseman says it is our character - our small, local businesses - especially those on Central Avenue. He's fighting to protect those businesses and St. Pete's character from overdevelopment of "formula" stores. Mayor Kriseman's priority for his second term is a 2050 plan. Climate change and sea level rise, as well as sewer and wastewater management will be some of the largest pieces of that puzzle. Mayor Kriseman is looking to hire experts in these areas to integrate these plans. The Pier: The new Pier will succeed in highlighting our best feature - our waterfront. It is about function over form. Penny For Pinellas: "I cannot tell your listeners enough how important it is to vote in favor of that fourth round of Penny. First off, the money that comes into the Penny isn't just from the residents of this area, it is everyone who visits us and spends money in our community, that penny of sales tax comes into our resources and gives us money that we can spend on infrastructure." On Regional and County collaborations: "I have worked really hard at building relationships with other elected officials around the region, with other governmental entities, with other organizations. Because I truly believe that we can accomplish more when we are all working together than when it is just about me." Kanika Tomalin, Deputy Mayor: "Anyone who has ever met Kanika knows that this is a brilliant woman, and she has been a partner. I cannot do everything, I cannot be everywhere and at least do it well. And to have somebody like her that I can rely upon, that I can say hey, there is something that I am really interested in us pursuing, I just do not have the bandwidth to do it, would you take it on as your project?" Chief Holloway: Kriseman chose Chief Holloway to head up the police department because he saw him as a leader who could bring the city back to community policing. Mayor's Shout-out: Kriseman is proud of the collaboration of our businesses and non-profits. The networks we create to lift up our local businesses and partner with non-profits are unique and set us apart. "All the craft breweries support each other. The restaurants support the craft breweries, who support the businesses, who support the non-profits. I have never seen such a network of everybody trying to help everybody else, recognizing that if one is successful the others are going to be successful and we are all going to be successful. It is really remarkable." All the craft breweries support each other. The restaurants support the craft breweries, who support the businesses, who support the non-profits. I have never seen such a network of everybody trying to help everybody else, recognizing that if one is successful the others are going to be successful and we are all going to be successful. It is really remarkable. The 2017 St. Petersburg Mayoral Race is shaping up to be the most expensive in city history. Garnering more than 1 million dollars in combined donations, Incumbent Mayor Rick Kriseman faces former mayor Rick Baker in an epic battle for the reins of a city on the rise. With the August 29th election quickly approaching, the St. Petersburg Group’s Ashley Ryneska sat down with each candidate to go beyond the talking points. Mayor Kriseman is the incumbent candidate. He has been serving as mayor since 2014. During his time in office, he has focused on raising awareness for small businesses, and creating collaboration between city, county, and regional entities in order to solve problems better and garner more funds from state and federal grant programs. He has also put a strong emphasis on putting the right experts in the right places to help the city succeed, the most notable examples being his Deputy Mayor, Kanika Tomalin, and Chief of Police, Anthony Holloway. 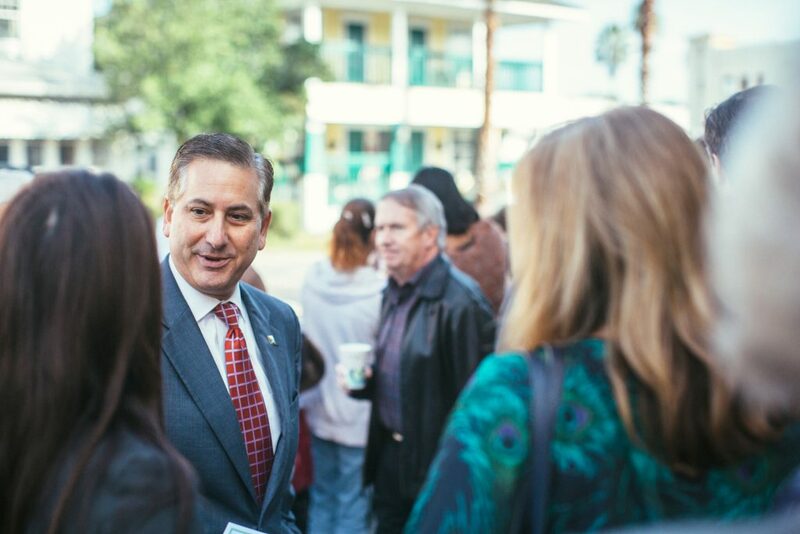 Mayor Kriseman is seeking reelection with a vision for creating a sustainable future of growth for St. Petersburg. With an eye on the long-game, he hopes to tackle a 2050 plan, which will include climate change and sea level rise planning, as well as sewer and wastewater/stormwater planning. We sat down with Mayor Kriseman to talk about his unique leadership style, his forthcoming view of national politics, and his plans for our city’s future. We have the opportunity on the local level, and we are the closest to the people, of being the innovators. Ashley: Hi, this is Ashley Ryneska and I am here today with mayor Rick Kriseman. Mayor Kriseman, welcome to the show. Rick: Thanks for having me on, Ashley. Ashley: And I did learn that you majored in Broadcasting. Ashley: From University of Florida? Rick: University of Florida, go Gators! Ashley: I have a feeling that by the end of this interview, somehow you will be interviewing me and it will off completely get past me. Rick: I was a disk jockey, so I didn’t do so much interviewing because I was typically on the radio from two to six am, or three to eight am. Rick: So, not a lot of guests wanted to come in to be interviewed at those hours. Ashley: What is your musical genres? Rick: Oh, man! I pretty much like all types of music. I can go from country to opera. I just love good music, I love the lyrics, I think lyrics can be really powerful. And I tend to look at the ’60s and the ’70s, but the ’60s mostly and the lyrics of the ’60s and how impactful they were. And unfortunately, a lot of the lyrics we see today in some of the music is impactful in a bad way, which, as a father of a teenager, gives me great concern. Ashley: I feel like the lyrics of the ’60s were a lot about social consciousness and about social responsibility. And it has changed. I have a four-year-old, so I am not quite yet… Right now, it is Barney and Big Bird and the language is clean, but I know in the next decade I will have to contend with that. Rick: It is scary actually, some of the lyrics and what they encourage. And there is a lot of bigotry, there is a lot of hatred that is certainly not what I want my kid to hear, or any child for that matter. And I think that is one of the reasons why, even today, you still hear music on the radio from the ’60s, and people still relate to it. I was at the Indie market over at State Theatre a couple of weekends ago, and the music they were playing was that generation of music, and I think they were playing it because the people that came there really could identify with the message that was in the music. Ashley: Right. I want to get into your childhood a little bit, and I know that you spent most of your childhood here in St. Petersburg, but your earliest years in Detroit. I would love to understand what impression that experience left on you. Rick: Yes. I grew up, and you see the commercial sometimes for Chrystler and they show 8 Mile Road, and of course, Eminem and 8 Mile. That is where I grew up, on 8 Mile. I do remember curfews and riots and the city burning. In some ways, it was a kind of thing that you thought well, that only happens in the South. But here I was in a Northern city and it was happening in the city and I was very young, and so trying to understand everything that was going on was difficult. But it certainly spoke volumes to the challenges that we had in our country, and what is unfortunate is while we have made progress, we certainly haven’t made as much as we should have. Ashley: Your father was a pretty important influence during those years. Rick: Yeah, when we moved to Florida he opened his own business. Back in Michigan he used to work for Sony corporation, but then we moved to Florida, he opened his own business. And yeah, a really powerful lesson is he always used to say to me “Always take care of the people that work for you. If you take care of the people that work for you, if you respect and show them respect, they will give you 110% and they will bust their humps for you.” And so, I used to see him do little extra things for the people he worked with and that worked for him. Even when he was just walking in the plant, always talking to everyone and not just I am the boss, you are a low employee. But saying hello to people, just simply waving and saying hello to people, and recognizing and validating them, the difference that it makes. That was a powerful lesson and I have tried to do that. When I had my own law firm, when I worked at a law firm and in my position as mayor, I try and always say hello to every employee that I see, and validate them. Ashley: So, in the vein of kindness and respect, you have had an almost visceral reaction to some of the national rhetoric starting from the presidential election that has ran very controversial, threads of discrimination, threads of, at the very worst, hate. And there was a tweet and a Facebook post that set ablaze, I think you got two million views. Rick: Yeah. I had never expected anything like that from that tweet, I think there was over 22,000 retweets of it. And the response was, in some ways that I got was very encouraging, but also very scary. Ashley: Tell us about the tweet and what you were responding to. Rick: This is right after Trump had announced back in December of 2015 that he was going to ban all Muslims. And for someone who is Jewish – my family came from Europe to the United States, and so a lot of my family lived through the Nazi regime and all of that, and a lot of them didn’t – and to me, when you start singling out whether it is a religion, or it is a race, or a gender, that is very dangerous. And I thought his comments were just outrageous, that a national candidate for president would make that kind of a statement. So, my intent was to put something up that was equally outrageous, just to try and call attention to how crazy this was. Little did I know, when I said that “I am banning Donald Trumps from St. Pete until I discover the danger posed by all Trumps.” And I used that, especially the back part of it, to really try and convey that this was tongue and cheek, but at the same time it was just calling attention to how absurd it was. Some people were like “Thank you for doing, thank God for standing up and speaking out.” And then the hate started, and the nasty phone calls and emails, and messages that we started receiving. And I was shielded from a lot of them by my staff, who took the brunt, quite frankly, of a lot of the calls. I did see a couple, and they were pretty awful. One of them super-imposed my face on a Nazi concentration camp survivor, and the message was “You and your tribe are the real problem.” Another one put the yellow star on my forehead. And that, even back then really said to me that this campaign is making hate okay. Ashley: There is a permissive quality to it, perhaps. Rick: There is. There was, and there still is. And you look at, in light of what happened in Charlottesville, and the comments, or lack of comments by the President, and not specifically calling people out, calling groups out and talking about both sides. That is giving permission for that kind of conduct and that behavior and that thought, and the hatred to exist, and saying “It is okay with me if you guys do that.” Again, as a father that is really scary, because I am really worried about the future of this country and the direction that we are headed right now. Ashley: It hasn’t changed your transparency, though, in the least in terms of potential backlash that you got from that social media post. You have continued to vocalize your ideology and your value system in less controversial ways, I think you have maybe learned something from that experience. That carries us over into your leadership, certainly with respect to our community, which you have still identified as suffering from divide to some degree. And I want to talk a little bit about what you have done in the South side, and you commented that in South St. Pete it is not about quality as much as it is about equity. Can you explain what you meant by that? Rick: Yeah. So, when people think about equality they are thinking about you are trying to do things on an even playing field, that are level. And that assumes, if you are talking about equality, that you already are at a place where you have equality. So, if you are going to spend – and I will just throw numbers out – if you were going to spend a million dollars in one area of North St. Pete, you would spend a million dollars in another area in South St. Pete, because that is providing equality, it is putting the same amount on both sides. To me, you cannot do that if you do not have equity first, and you are not already at a place of equality. And so, I look at the investments that have been made in South St. Pete, I look at where we are in South St. Pete versus the rest of the city, and we are not in a place of equality. And I think that means that you have to sometimes spend more to try and get to a place of equality and create real equity. So, I think there is a real difference there. Four years ago, I was running for the seat and I said that I always felt like Central Avenue was this historic divide between the city, and if you lived South of Central you didn’t receive the same attention, you didn’t have the same opportunities, whether it was in jobs or in facilities, or whatever it was. And so, my goal has always been to, as I call it, break down that artificial barrier and create that, through equity, get to a place where everyone has the opportunity no matter where they live, whether they live South of Central or North of Central. I knew that it wasn’t going to happen overnight, I didn’t have any expectations that it would be something I would be able to get done in a term, we certainly would do everything we could to start moving the needle, but we didn’t get to where we are at overnight and we weren’t going to fix it overnight. And in some ways, the hardest part is having the patience to continue the efforts because you want it to get done overnight, you want to see that change. Ashley: I was going to ask you about that. You have to sell the long game in much of the work that you do, and you have the vantage point of being involved in local and State politics. And you know the system, you know how it works, but maybe your constituency doesn’t fully appreciate that, and maybe you have to do some overcorrection, explaining the benefit of foundational, systemic change. How have you been able to sell that? Rick: It is hard because, especially more today than we have ever been, we are an instant gratification society where we want things to happen, everything happens quickly, social media is fast, it is instantaneous, everything is bam-bam-bam. And so, the inclination of the population is we want to see change be the same way, and the reality is that it rarely ever is. And I am 16 years in public service now, my approach has always been kind of the same. First off, I am not going to do what I think is politically expedient and what is going to help me win a reelection. I am going to always try and do what I think is right, and if people agree with me that that was the right thing to do they will reelect me, if they don’t then they won’t. I have also tried to do it from the standpoint of putting the foundation in place, so that the things I hope to accomplish that they still get accomplished, even if I am no longer in that seat. We have gotten the boat going in the direction we need it to go, and even if I am not there anymore, it is going to get to where we are trying to steer it to. 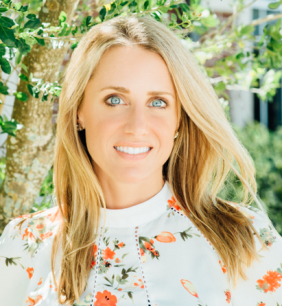 Ashley: I think Dr. Ellen was speaking recently about the merger of All Children’s and Johns Hopkins, and he mentioned and coined the term Hero’s Journey, and it was the two-year plus period post that merger, and it wasn’t just long view, it wasn’t just a plateau, it was grueling. And he said in those two years, that is a really critical period, you don’t see what you had expected to see, but you also get a tremendous amount of attrition, you get motivation and morale starts to be affected, and that is just the way it goes. And really the heroes are the organizations and the groups and the leaders who actually can guide their team through that. Rick: Yeah. And that really in a lot of ways goes right to the heart of what we have been trying to do South of Central with the way we have approached things. And I have been really upfront and said look, we are going to do it differently. We looked at the history of how things were done in South St. Pete, how were investments made, what was the effort to lift people out of poverty and to grow economically the community. And what we saw was the same thing being done over and over again, and as a result you weren’t seeing any real changes. And even the Tampa Bay Times recently reported about that, and that was the same conclusion they came to. And so, what we decided was we have got to try something different. And I encourage all of our employees, I get to meet with new employees all the time and I encourage them “Look, do not do it the same way it has always been done. Even if it worked, always look for a better way, something that is going to get you a better result. And do not be afraid to try something and have it not work, because that is how you learn and that is how you grow.” And so, what we have said is alright, we are going to try, instead of just investing in appearance and buildings, which is the way it has been done in the past, we are going to invest in people and businesses. So that is what we have tried to do with the CRA, which is the largest in all Pinellas county, taking those resources that are being generated in that CRA and investing them back into people and into businesses. And the risk is, especially, again, if I was concerned about reelection, you do not see it, we have to talk about it. And you can tell people about it and they will go hey, that is great. But a year later they may have forgotten that you did that, or even six months or three months later they may have forgotten that you did that, because it is not something they can drive by every day and physically see as a reminder that reminds them that is how you invested your money. Ashley: It is interesting, and I am just going to use early learning, for example, in those efforts in South St. Petersburg. Part of the case is every dollar that is invested, yields six to nine dollars in return to the community. And that is twenty years after the child leaves the second or third year classroom, once he or she is employed and working in the community. And so, if you look at the child scribbling the letters on a piece of paper, it is not apparent what that investment is going to look like. Rick: Yeah, if you are concerned about short term return, then you would never do any of the things that we are doing, because we are not going to get short term return for the most part. In some cases, we will see a little of it, but what we are looking for is to start seeing trends happening and seeing the needle starting to move. And we are starting to see that a little. Ashley: I think you are. I think I recently read there has been 174% increase in businesses over the last three years. Rick: Yeah. In business registrations, yeah. Rick: Yeah. And roughly 400 new businesses have opened South of Central. If you drive down 4th, or you drive down 22nd, and you drive down 34th street, you are starting to see the impact of our efforts. But here we are, we are three and a half years, almost four years into it. And it didn’t happen in year one, it didn’t happen in year two, but we laid the ground work so that it would start happening. Because, again, our goal all along has been to do things that are sustainable, that are going to last, because I think what has happened to the community for too long is a lot of promises have been made, they get something delivered to them and a year or two or three later it is gone. And so, the community feels let down, it is like you made us this promise and now it is not here anymore. And that has happened over and over again. And so, we have been really deliberate in trying to avoid that. And again, we’re having to be that hero leader and say “Hang with us, give us a chance to do this and let’s look at what we are trying to do and trying to accomplish.” And trying to get buying on that for the fact that if you give us a chance, we could make a difference here. But if we go back to the way we were doing it, we know we are not going to, because we didn’t. Ashley: What sort of support are the new businesses – so the 400 odd businesses that have opened in the past year alone – what support are they getting in terms of business acumen, in terms of financial literacy if that is needed? What are you bringing to that specific community? Rick: A couple of different things. We have got great partners and Government cannot do it, nor should Government do it on their own. And so, you got to have great partners, whether it is a partner like the Chamber of Commerce, who has been a fantastic partner with the city, or it is non-profits, or it is a faith based community. All of those entities, I think, need to be partners with the city government and moving the city forward. We have a great partnership with the Chamber and together we have created the Green House, which is a one stop shop where you can go in there, if you have never opened a business before learn how to put a business plan together, nots and bolts from start to getting your doors open, where to go for financial resources, we can help with some startup funding. We have put money into the TBBIC, the Tampa Bay Black Business Investment Corporation, which also helps invest in new and existing businesses to help them grow. And so, we have tried to create an atmosphere and an environment where entrepreneurs have a real opportunity of getting the information they need, to learn how to open or, if they already opened, take that next step in their business and in that business’s growth. And then the there thing that we have done is we have another partner, and this one is through the National League of Cities, who has helped provide funding through a grant for us to open a financial empowerment center, and we have got some other partners – the United Way, and Duke, and Cross and Anvil – so we have got a lot of folks that have come together here to really teach financial literacy. And initially the thought was let’s just work with kids, but we have got to work with their parents too. And so, it’s a kind of all-inclusive program to teach about how to earn money, how to save money, how to invest money, what to do with it, where to put it. And that is how we will start making change in the community. Ashley: So, you mentioned the Green House and I agree with you, that is a tremendous partnership, it has been very inspiring to see what has even happened with the one million cups event. And I think it is live streaming now, and I find myself missing it if I am not watching. And what is really cool about it is seeing some of the businesses and personalities that we see on the street every day succeed. And you and I were having a conversation, part of it recording and sharing some of those names, and I would love for you to share a story of a business and individual that you have witnessed flourish from the resources provided through the Green House. Rick: Yes, I will give you two. And in fact today we are doing a grand reopening for Rush Hour Chicken & Waffles on 34 Street. And this is a guy who is living his dream and opened a restaurant and got help from the Green House and went through the programs. And now we are doing a reopening, because he has expanded, he has a full-service bar that is going to be there. Still has great chicken and waffles, if you love chicken and waffles man, you got to check it out. But it is a great story, and then another one is Amy with Strands of Sunshine. And I still remember when she opened in a small little store front, that I think it was on… can’t remember if it was on 5th or 6th. Rick: Sixth. And she is in a much bigger space now, we have actually used her in some of our marketing efforts. Because to me, when we market the city, the best way to market the city is to tell the story of the people in the city and the businesses in the city. And she is just an example, again, of somebody who has utilized what we have offered through the Green House, and taken the business and really done some cool things with it. And both her and Rush Hour, great businesses. Ashley: You were recently a part of an independent corridor march. Tell me a little bit about that. Rick: The city obviously is experiencing a huge growth that has happened over the last couple of years. And while we are very excited and very pro-growth and we want to see the city continue to grow and create jobs and the economy thrive, we also want to be very aware of what makes the city special and the character that we have in the city, and really that is our small businesses. And in particular you look at Central Avenue, which to me is kind of the spine of the city, and the concern that I think a lot of folks had shared with me was it is all great that we are having this growth and we all want to see this growth, but we also don’t want to lose our character and what makes our city special, and Central Avenue is a big part of that. And so, we have done two things. We did a march to call attention to all of our small businesses along that quarter, we went from I think it was 2nd and Central, all the way to 31st and Central, which was a long march. Ashley: Got your exercise that day. Rick: Yeah, I had the wrong shoes on, that wasn’t a real thoughtful idea by me. But it really did call the attention to the variety and the quality of the small businesses that we have that are along that entire corridor. And we put an idea out on the table, and we put it out because we wanted to start create a discussion in the community and with residents, with businesses, with property owners, with developers. And that is: what do we want to look like, and how do we want to maintain what we look like? Do we want to do it via, as people often say, the carrot or the stick? Do you want to offer incentives to preserve the character, or do you want to use a stick and penalize or make it difficult for what we were calling formula businesses? And we don’t even have a real definition yet for that, but people think of it as a chain. So, do we want to disincentivize chains? So that is a discussion that is still ongoing, but it is a really important discussion, because what makes St. Pete different, why I think people want to come here and visit, why I think people want to live here and stay here is because of the uniqueness of our character, and how you don’t go down Central and see what you would see in every other city, you see businesses that you wouldn’t see in other cities. And that is what makes us different. And it is equally important, it is something we are dealing with in our neighborhoods too. A number of our real historic neighborhoods, whether it is Old Northeast, or it is Kenwood, or Crescent Lake and Crescent Heights, they have some real concern about losing their character, seeing houses torn down and McMansions being built, or in very historic neighborhoods seeing modern homes get built that don’t match the character of the rest of the neighborhood. So, it is, I think, an issue that as a city we are going to have to really work hard on and figure out how do we find that, as I call it, the sweet spot between continuing to grow – which is important, because if you don’t grow then you start sliding backwards – so, continuing to grow, but doing it in a smart way, and in a way that respects our character and our feel. Ashley: And you really encourage the community to take a look at the issues around climate change. And so, when we think about density planning and zoning, and you talk about downtown, which is the spine and really the core of business, and then we look at planning in the peripheral areas around downtown, how will your efforts and your focus on climate change coalesce with that planning? Rick: …yeah, for us to do a 2050 plan. And I think the timing is perfect, because we are already going to be engaging on an integrated sustainability action plan to plan for the impacts of climate change and sea level rise. We are already embarking on a storm water and sewer master plan. So, all of these plans have to be integrated, they all have to work with each other. They cannot be done in silos and separately, because what we do on our storm water system and how we plan for that, or our sewer system, is going to impact how we plan for sea level rise and vice versa. And that is going to impact how we grow our city economically and where can we grow, what is that going to look like, what is our zoning going to look like, is everything going to have to be elevated? And are there areas where we really need to stay away from massive development because of what the future may hold? I will just give you an example: The Rays are in the middle of looking for their long-term home in the Tampa Bay region, and one of the areas that has been suggested is the Derby Lane site, which has some benefits, but it also has some real challenges if you look at sea level rise maps and what that site is going to look like 20 years from now. And if you are going to build a stadium, you have to look at that. And so, for them to utilize that site, if that is the decision they made, they are going to have to implement plans that address the impact of sea level rise on that stadium 20 years from now. That is not always easy to do, to look that far out. But we don’t have a choice, we have to do those things. Another example of where we are trying to take into consideration climate change and sea level rise and what we are doing right now going forward is both the Shore Acres Rec Center that we are going to be rebuilding, and the Pier. Both of those structures are going to be built at higher elevations, they have to be. Because if we don’t, we are setting them and future city government up for having to deal with a significant issue that is going to cost millions and millions of dollars on the road. And so, I think it is incumbent on myself and City Council, and I feel very fortunate to have a City Council who is not only supportive, but is also at times leading the charge. And that is great, it’s a great partnership with us, between my administration and City Council, on addressing climate change and sea level rise and issues of the environment. We have to plan and all of our plans have to factor the impacts in, so that we are not burdening future Councils and future governments. Ashley: So, you have the city water masterplan, you have the storm water masterplan, you have got the planning around climate change and the implications there. What does that task force look like and that process look like? Rick: So, it is really going to be consultant driven. And a lot of times you would see a consultant doing the sewer masterplan, a consultant doing the storm water masterplan. And we are looking at making sure, if we end up going with two – and I think we are on the verge of making our selection – if we did two they have to build the work together. Otherwise we are just going to have one doing both of those, because they have to be integrated. And when you think about it, if you do a good job of preventing storm water run-off from going into the bay, it has got to go somewhere. And if you haven’t taken care of your sewer system, then it is going to get into that system, which is what the heart of our problem over the last two years has been, is storm water and rain water intrusion into a sewer system that wasn’t supposed to be there. So those plans have got to work together. At the same time, as you are planning for sea level rise, and you think that the higher our seas are, the slower when we have heavy rainfalls it is for that water to run off and to dissipate, which means that our grounds are going to be more saturated and there is greater opportunity for that water to sip into our sewer system. Again, that is all interconnected. So, all of these plans and all of the consultants have got to be able to work together. And we are actually living that right now also with the new Pier District. We had a group of architects who designed the Pier and the Pier Head, and then we had a different architectural firm that was selected to handle the first phase of the waterfront masterplan, which we call the uplands. But if those two firms weren’t working together, we were going to have a real disjointed project. And so, we have been able to get everybody working together. Even though they are two separate architecture firms, they are working together with the recognition that their projects are going to be connected and they have to be connected and they have to work together. Ashley: You had a really pointed statement around the Pier recently. This new iteration of the Pier is less about the Pier as the icon and it is really more about the waterfront as an icon. And that is a paradigm shift around this dialog, and I am interested in hearing your thoughts on that. Rick: I think where we got hung up with the first go around with the lens was the whole focus was on trying to build a structure that was iconic, and we got away from building something that was usable by the people who live in the city and by visitors to the city. And so, what we set out to do was to put first and foremost the function of the Pier and the Pier District. That, to me, had to be the most important thing, with what it looks like almost secondary. Obviously, you don’t want something that is horrible and ugly on your waterfront, but at the same time we felt like the primary driver had to be the functionality. And what we discovered as we went through this process, and certainly with the selection that was made by the committee, I think what came out of it was what is truly iconic about St. Pete, and in particular our downtown, is our waterfront park system. Very few communities in North America have a waterfront park system like we do. And I think we are so fortunate that our forefathers had the vision to protect the park system in the way that they did. And so, this iteration of the Pier really gave us the opportunity to add to what is the most iconic feature of the city, and that is our waterfront park system. While there will be a building at the end of the Pier and a place to go fishing, like there historically always has been, the focus wasn’t so much on creating an iconic building, it was on creating an iconic space. And I think we have done that. Ashley: So, when we look at investment in the new Pier project and much of what we have talked about in terms of city planning and reinvesting in our sea walls, our sewer systems, our roads, our sidewalks – knowing that this investment needs to be made and that we need to divert resources to this effort naturally in respect to fiscal administration, we are going to have to suppress spending in other places. Give me some thoughts as to where you think that balance needs to shift while we fix this issue. Rick: That is a great question and it is one that I hear a lot, especially when we are talking about the Pier. There certainly has been a segment of the population that at one point in time or another said “Do not build the Pier right now, take the money for the Pier and use it on infrastructure.” And the hard part has been trying to get people to understand that we are governed sometimes by the law, which requires us or prohibits us from using certain buckets on certain things. And so, the Pier for example, large part of the money that we are using to fund the Pier comes out of what is called the intown CRA, or intown Community Redevelopment Agency, or Area. And because it comes from that area it can only be spent in that area. And so, when people were saying to me “Why aren’t you using the money for the Pier, why don’t you spend it on Southwest plant in increasing capacity instead, or on fixing our pipes?” The answer is because I legally cannot. I cannot use that money, because those things that you are asking me to spend it on aren’t located within that geographical area and that boundary, and so I cannot spend it on that. And so, we are having to look at other areas and you are absolutely right, it means you have to make difficult choices. And we are getting ready this November on the ballot is the fourth round of Penny for Pinellas. And I cannot tell your listeners enough how important it is to vote in favor of that fourth round of Penny. First off, the money that comes into the Penny isn’t just from the residents of this area, it is everyone who visits us and spends money in our community, that penny of sales tax comes into our resources and gives us money that we can spend on infrastructure. So, it isn’t just us paying it, it is visitors from out of state, from instate, from across the bay, it is from all over that help fill up that bucket of money that comes to us through Penny for Pinellas. In years past, a lot of those resources have gone into libraries and rec centers and parks, and those are important things. But if you are heavy in your spending on those things and lighter on infrastructure, at some point in time you got to pay the piper. And that time has come. We have got to really do some serious investments in our infrastructure. And so, just to give you an example, what we are proposing to Council and we have also heard from Council, is for this next round of Penny, instead of somewhere around 40% being spent on infrastructure, we are going to recommend and the Council I think is going to run with the idea of spending closer to 80% on infrastructure. And of course, that means that you don’t have as much to spend on parks and on libraries and rec centers. And if it had been more balanced, then our spending could be more balanced. But historically it wasn’t. In fact, in Pennies round two and three the city spent zero on sewer system infrastructure out of those two Pennies. Out of this round of Penny we are recommending about 90 million of a total of 326 million, which is a pretty substantial amount, just on our sewers. But we also have to spend it on storm water, we have to spend it, as you said, on roads and sidewalks and bridges and sea walls, and buildings too, that we have that are aging and need to either be rebuilt or renovated. So, we have got to do it, it is a hard choice, it is not one that politicians typically like to make. You look around the country and no one has historically spent the kind of money they should be spending on infrastructure. As we like to say, you don’t get to put a plaque on it with your name on it. Nobody is putting a plaque on a pipe that is buried underground, you don’t typically do ribbon cuttings or ground breakings for those things. But it doesn’t mean they are not important, and they are important and they go to everything, there is no quality of life, there is no economic development if you don’t have good infrastructure. Ashley: Maybe it is a naming opportunity for every citizen in St. Pete to play a role in what their community is going to look like and how it is going to operate, and support future generations. And I do not imagine any of these decisions to be easy ones for you. And when you look at local governments, I think you stated before that President Obama once addressed you with a group of your colleagues and said “Listen, Washington is corrupt, Tallahassee or state governments are largely corrupt and a local government has tough job, yet there is some freedom in authorship, there is some freedom in innovation and with that comes some tough choices.” I would love to hear your thoughts on how the culture of local government has morphed over the last four years and what you see forward down the road. Rick: That is a great question, and I think President Obama was absolutely correct. And we have the opportunity on the local level, and we are the closest to the people, of being the innovators, and to doing things differently and really putting policies in place that we couldn’t get through in Tallahassee, or other state governments, or in Washington. So, some of the things that we have done here in St. Pete are putting in place and challenging all of the business community to do the same. In city government we have put in place a parental leave policy. So, if you are a woman or a man, you have a newborn baby, you are going to get six weeks paid leave. So, you are not having to make those decisions at the most critical time to spend with your newborn child: do I work and continue to be able to pay my mortgage and my rent, or do I stay home and worry about those things? We don’t want our employees to worry about those things, we want them to be connecting with their child, because that is going to lay the groundwork for that child’s future. And it means, when they come back to work they are going to be better prepared, more energized, more enthusiastic than they would have if they were worrying. We raised the minimum wage and we have created a 15 by 20 challenge, so we will be at 15 dollars as our minimum by 2020. And again, we have challenged the business community, and companies and organizations, like the Tampa Bay Rays, have taken that challenge on and they are doing the same thing and they are implementing those policies. We have created second chance policies for our kids, and hard-to-hire ordinance for our adults. So, if you are a kid and you make a mistake that is a misdemeanor, it is not a violent crime, you are going to get a second chance, you are not going to have an arrest on your record that is going to be with you for the rest of your life. You’re going to have to do community service, you are going to get some counseling, it is going to be immediate, so there is an immediate penalty for your conduct, but you are going to have that second chance that you need. And for an adult that has done their time, paid their dues, want to come back and have a chance of being someone who contributes to our city, we have got a hard-to-hire ordinance that Council passed, that will require companies doing business with the city on construction projects, for example, to have to hire a percentage from those who have made a mistake in the past, to give those folks a real opportunity. And so, those are things that we can do on the local level that state governments are not willing to do, or just do not have the political will to do. Ashley: You also have the ability to identify synergies both within local government and throughout the community. So, when you look at our public sector or private sector and opportunities for more effective collaborations, what are your thoughts on that? Ashley: Who has a better sense of humor? You, or the mayor of Tampa? Rick: We have a different sense of humor, and Bob and I have been friends for about 20 years. We are good friends and I appreciate what he is doing over there, I think he has made tremendous strides in Tampa at really bringing their waterfront back to life and bringing life back to downtown Tampa. In some ways, Tampa and St. Pete had opposite challenges; they have got lots of office, but none of residential and so five o’clock their downtown closed; we have lots of residential, not enough office in downtown St. Pete, so we want to get more business in downtown St. Pete in addition to all the residential we have. But Bob has got a good sense of humor. Ashley: A theme that I have gleaned from this conversation is really an emphasis on collaboration, on partnerships. You are not a mayor that insists on doing it completely alone, in fact you look for support, you look for experts in specific fields. And I would like you to talk about that shift in leadership strategy. Rick: Well, I have always been a big believer that first off, when it comes to leadership, the best leaders surround themselves with the smartest people they can find, and they empower those people to feel confident in expressing their opinion, even if it might be something that the leader doesn’t want to hear. And so, I have tried to do that. But I also think that great leaders recognize that you are more powerful when you are able to collaborate, when you are able to have partners and get by. And as such, I have worked really hard at building relationships with other elected officials around the region, with other governmental entities, with other organizations. Because I truly believe that we can accomplish more when we are all working together than when it is just about me. And that same thing, if you look at how the city has marketed itself, it isn’t commercials and marketing pieces that are just “There is Mayor Kriseman, ra-ra-ra”, it is let’s feature people in the community and let them tell their story and why they love St. Pete. Because I think that is a lot more impactful than it is the mayor just spatting off about himself and what he has done for the city. It is letting people tell their own story of why the city is great and how this city has given them opportunities, and it is city as a whole, it is not city as the mayor. Ashley: You have also been routed for the hiring of deputy mayor Tomalin, and also chief Holloway. And I am curious as to what characteristics rise to the top when you are selecting those that serve most closely to you. Rick: Those were obviously two of the best hires I could have ever made. And I caught a lot of flak initially when I hired chief Holloway, and there were some characteristics, certainly in the police chief – and I believe that is the most important hire a mayor can have, because public safety sets the tone for everything, for neighborhoods, for quality of life, for economic development. If you do not have good public safety, you have a problem with all those things. And so, there were certain boxes that I had to check off to make sure I had the right person. Community policing was so important to me, I felt like we had gotten away from it, we had to bring it back. Because I really felt like the community in the department had lost faith in each other, there wasn’t respect, there wasn’t a relationship and I felt like community policing would bring that back. And when I met with Holloway I was absolutely convinced this guy has a plan for how to bring it back, and I think he is going to be able to accomplish it. I also wanted an officer, or a chief who was not someone who would be whole up in their office, that would be out in the field and getting down and dirty with the men and women he overseas, and wears a uniform, not just a suit. So, one of the questions I said is suit or uniform, office or patrol car? Questions like that. It seemed kind of silly, but they really tell you about the kind of philosophy that chief had. And I think we hit a home run. And again, I narrowed it down to four just to choose one of them. Certainly, one was a favorite of the community and I would have made a lot of people in the community happy, but I did not feel that it was in the best long-term interest of the city. And so, I was willing to take the heed to do what I thought was the right thing long-term for the city, even though it might not have been the politically expedient thing. I got no push back on Dr. Tomalin, anyone who has ever met Kanika knows that this is a brilliant woman, and she has been a partner. I look at her as she is my partner. I cannot do everything, I cannot be everywhere and at least do it well. And to have somebody like her that I can rely upon, that I can say hey, there is something that I am really interested in us pursuing, I just do not have the bandwidth to do it, would you take it on as your project? Or having someone who comes to me and says “Mayor, I have this idea, what do you think about this?” And I am like oh my God, that is a great idea, let’s do it, would you spearhead it? And her saying “Absolutely” and running with it and then doing a knocked down, bang out job with it. Ashley: She absolutely does. And in that vein we are getting close to the end of the show, and we have a shout-out that we would like our guest to provide to an individual, or an entity, or an organization that maybe doesn’t have a tremendous amount of visibility or eyeballs on them. This is a hard one for our city leaders to select, and to pick just one may be painful. Rick: Yeah, you get in trouble when you pick one. I always love “What is your favorite restaurant?” So, whoever I do not select is going to be upset with me because I did not pick them. Ashley: But who you do select, free meals for a month for you. Rick: I was asked yesterday in an interview what is one of my favorite places, or what do I think is one in the top ten things to do in St. Pete. And my answer was stroll down Central Avenue, because you will see so many individual, unique businesses, galleries, restaurants that are all different and they are all outstanding in their own way. And I am a frequent visitor and I love to just walk down Central and go into shops. A lot of times I have got certain places that have become my go to for gifts because I always find something there, or I want to get something great to eat that I got a craving, I go there. We are lucky we have some great non-profits that are working really hard in this city, and a lot of them are doing things behind the scenes. We just opened another great craft brewery at Flying Boat this last weekend who just came into the community, but the same day they are doing their opening they have got Friends of Strays there. So, they are doing something for that organization, which… I think this isn’t answering your question, but the thing that I love about this city, that I think makes this city so different than so many other places, is the level of collaboration and support between the business community themselves, the non-profits, themselves and the business and the non-profits. You don’t see that everywhere. All the craft breweries support each other. The restaurants support the craft breweries, who support the businesses, who support the non-profits. I have never seen such a network of everybody trying to help everybody else, recognizing that if one is successful the others are going to be successful and we are all going to be successful. It is really remarkable. Ashley: Absolutely. And in that energy, I may put you in the spot and ask you to close this show out with maybe a verse or two from a ’60s song that encapsulates that spirit. Ashley: This could be wrong, no one Googled this. Rick: There is a couple of songs, and they aren’t ’60s songs though, that have come into my head recently. They are actually country songs, and it is one of the reasons I like country music, because the lyrics are great. Ironically, they are both Garth Brooks songs. And one is about standing outside the fire, “life isn’t tried, it’s merely survived if you’re standing outside the fire”. Sometimes you have to jump in and take your chance, you might get burned a little bit, but if you don’t you are just surviving. The other is about unanswered prayers, and “sometimes I thank God for unanswered prayers, remember when you’re talking to the man upstairs, just because he doesn’t answer doesn’t mean he don’t care”. And I think a lot of times in life we get upset about things that we prayed for that we don’t think happened, but sometimes we are so much better off because they didn’t, a different door opens that takes us in a much better place. Ashley: A wonderful note to end on. Mayor Kriseman, thank you so much for being with us today. Rick: My pleasure. Thank you.